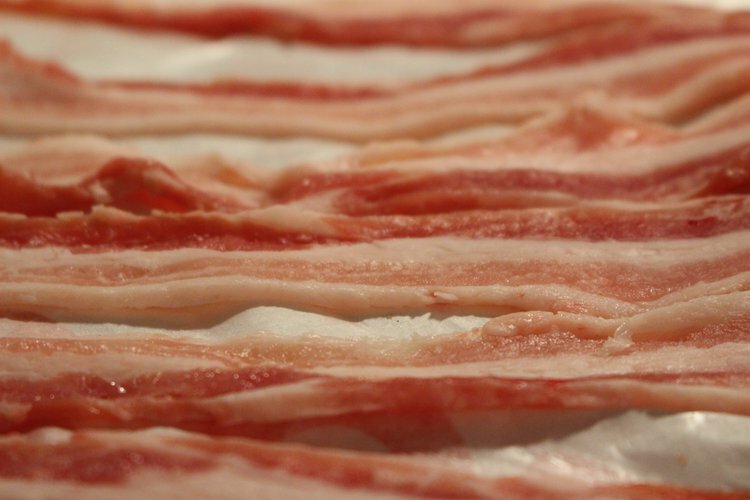 What Are The Negative Health Effects Of Bacon? Although it's okay in moderation, bacon served in small portions and mixed with antioxidant rich foods, such as fruits and vegetables can still be part of a healthy diet. It should not come as a surprise that bacon, despite its incredible flavor and adaptability to every meal of the day, could have a substantial negative impact on your health. Bacon has gained a rebirth in the food industry, as it is now added to items beyond the breakfast menu such as sandwiches and appetizers. But, you should take the time to consider that it might not be worth the health risk. As per USDA Nutrient Database SR18, approximately 68% of the calories in that savory pork bacon slice are from fat. About half of these fat calories in bacon are saturated fat. It is recommended to limit your saturated fat intake to no more than 7% of your total calories in one day. Also, bacon nutrition facts show that one ounce of bacon contains 30 milligrams of cholesterol. When you are indulging on that juicy, crispy piece of bacon, you may not realize that bacon is considered a processed meat. More importantly, you might not understand that you could be significantly affecting your body’s health if bacon is consumed regularly over time. The American Institute for Cancer Research defines processed meat as “meat preserved by smoking, curing, or salting, or addition of chemical preservatives.” These processed meats include bacon, ham, sausage, deli meats, and hot dogs. A study conducted in 2010 by the Harvard School of Public Health discovered that consuming processed meats, such as bacon, is linked to a 42% increased risk for heart disease; and if that is not enough, a 19% increased risk for type 2 diabetes. Thus, it was found that consumption of processed meats plays a mediating role in increasing the incidence rates of cardiovascular disease and diabetes mellitus. There were no statistically significant variances between specific processed red meats and total mortality. Nonetheless, hot dogs and bacon were associated with a higher risk than other unprocessed meats. In 2012, a study completed by the Harvard School of Public Health concluded that even little portions of processed meat consumed on a regular basis has a significant correlation with an increase in colorectal cancer, cancer mortality, and cardiovascular disease. Therefore, it is recommended that these foods be avoided. The causal link between increased risk for colorectal cancer and regular processed meat consumption is not yet defined, but several mechanisms are being researched. Some of these mechanisms include the presence of nitrates, the effect of meat smoking, effect of high temperature on the DNA in the meat, and how iron affects the lining of the colon. If you still must indulge, there are a few options for reducing the guilt. When looking for bacon options that are lower in fat, center cut bacons should be chosen. Turkey bacon is also a healthier alternative to pork bacon. Despite its similar cholesterol content, it has less saturated and total fat. For the bacon lovers, you should not make bacon a daily menu item. However, with caution, bacon should be served in a small portion and mixed with antioxidant rich foods, such as fruits and vegetables. Other processed meats should be significantly decreased in the diet, if you are prone to consuming bacon on a regular basis. Rohrmann, S., Platz, E. A., Kavanaugh, C. J., Thuita, L., Hoffman, S. C., & Helzlsouer, K. J. (2007). Meat and dairy consumption and subsequent risk of prostate cancer in a US cohort study. Cancer Causes & Control, 18(1), 41-50.
van den Brandt, P. A., Botterweck, A. A., & Goldbohm, R. A. (2003). Salt intake, cured meat consumption, refrigerator use and stomach cancer incidence: a prospective cohort study (Netherlands). Cancer Causes & Control, 14(5), 427-438. Varraso, R., Jiang, R., Barr, R. G., Willett, W. C., & Camargo, C. A. (2007). Prospective study of cured meats consumption and risk of chronic obstructive pulmonary disease in men. American journal of epidemiology,166(12), 1438-1445.